Today was our first day of the 8 day circular walk around the Lake District that I’ve planned. I was hoping for some bright spells this afternoon so I carried my Mamiya 7 camera and Gitzo tripod in my rucsac. A total weight of 13kg, a lot more than I normally carry and my bad back noticed it straight away. We left the Woolpack in Boot at 9am in the rain. The forecast was unfortunately correct! As we climbed higher we were soon in the clouds with visibility of about 50 yards. We had no views at all until we dropped down into Wasdale at the end of the day. 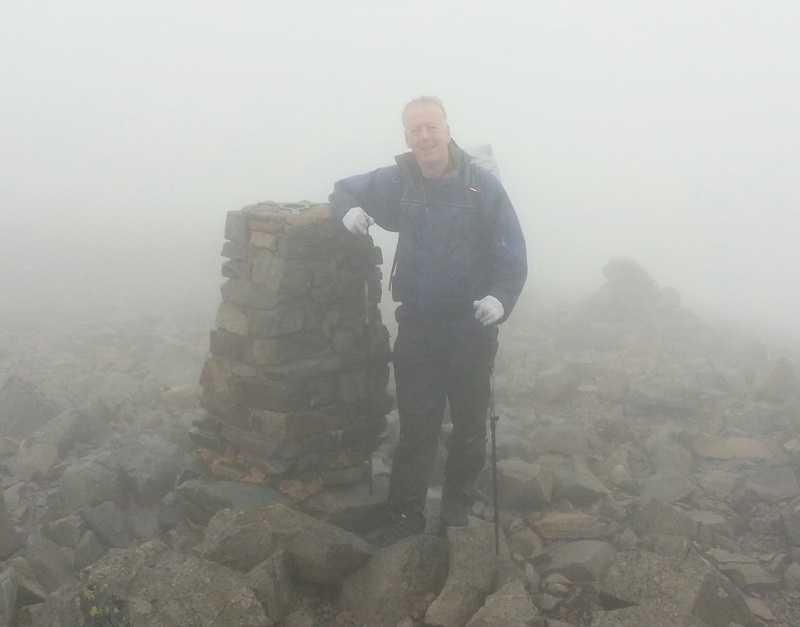 We made it to Scafell at 12.15 but didn’t linger as there was a cold wind with the rain. Dropped down to Foxes Tarn for lunch, Jan’s home made flapjack with a couple of dihydrocodeine to help reduce the pain from my back. 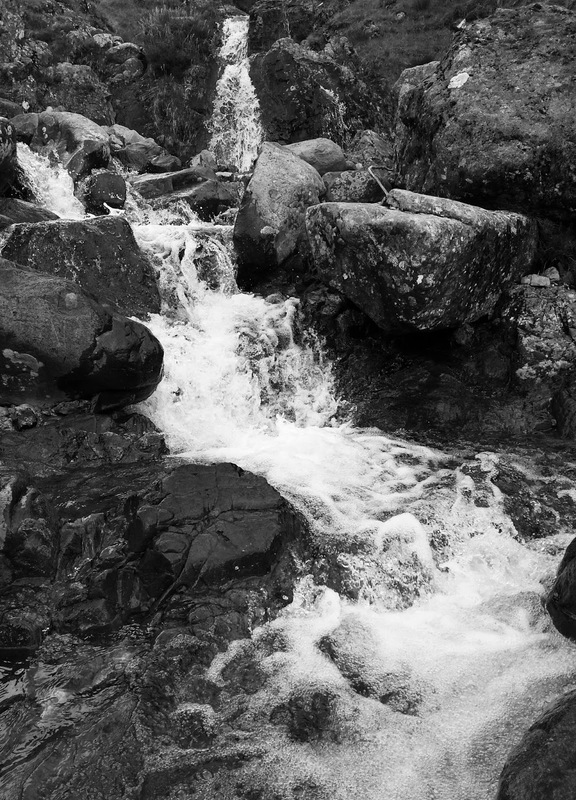 The descent from here was dreadful, loose wet rock, jolly slippery. We detoured off about 50 yards to avoid one particularly bad steep section. Then up to Mickledore and Scafell Pike (highest mountain in England) by 2.15pm. Still no views. I took a Naproxen to help further reduce my back pain. It worked quite well. I remembered that I needed a photo for this blog and asked Al to pose next to the summit trig point. What a mistake, 10 minutes later he’d done his hair and let me take the shot! I used a wide angle from a distance to avoid having Al’s hair overpowering the shot. The path down was very good, like a mountain motorway so we made good time. We were soon below the clouds and I was looking for photos. We could see sunshine below and clouds around the tops were moving fast. We stopped and I waited for the clouds to lift and thin. They duly obliged and I took a few shots towards Scafell and Mickledore. 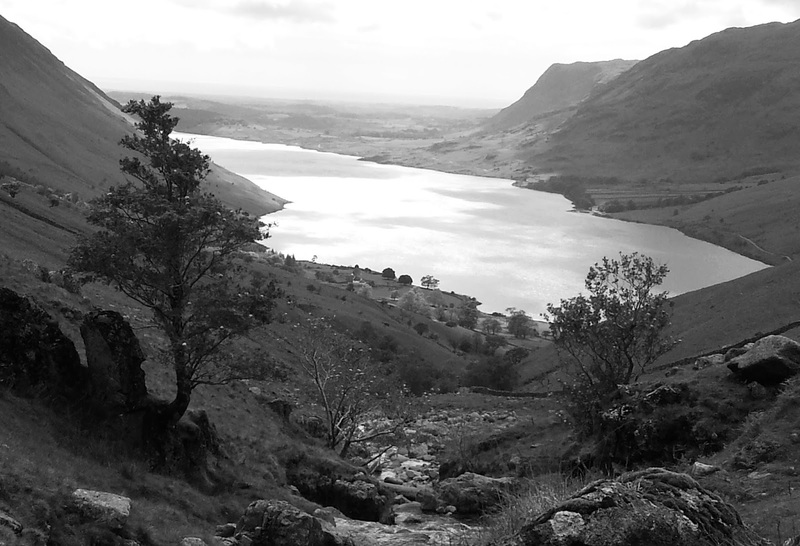 The light improved as we descended and the next stop was some waterfalls with sunlit Wast Water lake in the background. Then down to our hostelry for the night, the Wasdale Head Hotel. After checking in, collecting our luggage and dropping off our rucsacs we headed for the bar. Shock, horror, there was no Yewbarrow which is one of my favourite beers. The brewery is up for sale and not brewing at the moment. The Corby Noir and Jennings Mild are my replacements. Tomorrow we walk over to Borrowdale and the forecast is great! Will take kitchen sink as far as camera gear goes including infrared film and filters.